“Changes all around me - sometimes I wish that it weren’t so. Little did I realize the significance of those lyrics when I penned them in 1993. “Changes” was the title of that ballad on the FIRED UP album. Back then, I was very insecure about singing the lead vocal, but today I’m glad I did it…especially with the challenges I’m experiencing with my voice. Writing and producing each song on the albums “ONE by ONE” and “FIRED UP!” was probably the most rewarding project of my entire life. Music is the language of the soul…and the emotions of that era are resurrected when I hear their familiar melodies. If you would like, you can listen to the songs on my personal website at www.group20kennywayne.com – they’re listed on the Original Music tab on the home page. One thing we can be certain of in this world is change. Change can be rewarding even when it is painful. It all depends on our view of life…you know, the glass is either half empty or half full. We can be a victim or a victor…we have a choice as to our reaction to life’s challenges. < My ability to communicate vocally is a major challenge. I’ve attempted twice now to videotape a 5 years since DBS surgery (to add to the ‘1-year’ and ‘3-years after’ videos already posted on YouTube on my ‘april13kid’ channel)…and failed to adequately articulate my current situation. I’m not sure right now as to when or how I’m going to pull that off. < We’ve recently been introduced to Young Living Essential Oils as well as some herbal supplements that are very promising in alleviating a number of symptoms I’m dealing with both physically and mentally, and am pleased with the prognosis. < Adjusting to new doctors at Cedars Sinai has been relatively easy. Dr. Tagliati and Dr. Tan have been a great encouragement to me. I’m very happy with their abilities. < I’m learning that with my daughters and their children, I don’t have to ‘speak’ to be ‘heard.’ They don’t need to know what I care about, they just need to know I care…about them. < The same is true with new friends in the community. I’ve come to realize that I don’t have to impress people with my words or ideas. If I will just sit with someone, ask a question once in a while, and listen to whatever they have to say, more goodwill is accomplished than by my eloquence or by trying to impress them with my knowledge. By being forced to limit my spoken words I’m learning there is much wisdom in “holding one’s tongue.” ‘Type A’ personalities (like myself) don’t learn this truism easily. It usually takes a crisis and then it’s still difficult. < Finally, I want to say how totally thankful and impressed I am with my wife, Beckie. For the past year, she has been a customer service manager for a large retailer and has weathered some fierce storms (both with physical leg pains and “pains in the neck” so to speak - with customers). I’ve seen both strength and grace develop in her to the point where she is like a different person. She is my hero. Apparently, many people who have PD are ashamed and/or embarrassed about the diagnosis. Do they see it as a personal failure? Or, maybe a defect? 2) and yes, it's a defect. So What? Does that make me "bad" or "undesirable"? No way! Today, at age 63, Parkinson's is not a 'career buster' for me, but rather a journey to a new place - mentally, physically, emotionally and spiritually. North Hollywood to Modesto, Sacramento and Yuba City, CA. o professional videographer and audiovisual contractor, producer/director. To be certain, I've had a very full life and my bucket list is small. I'm sure there will be some surprises yet to come, but I have learned that adversity happens. How we respond to adversity determines our well-being in this life...and potentially, it determines our status in the next life to come. A place where the 'glass is half full' --- always. ACCORDING TO CAREY .... OUR FIRST GUEST POST!! If I were to list for you all the people in our life who have faced chronic or life-threatening illness you’d probably start running in the opposite direction. Suffice it to say, we know a few …. including ourselves. The one positive about this is, when meeting people for the first time who are facing a medical diagnosis, our personal story and experience give us some credibility. There’s nothing more rewarding than being able to pass along knowledge that might help someone on their journey. Through our blog we have the opportunity to connect with people from around the world. We find ourselves repeatedly talking about certain issues that I refer to as my “soapboxes” ….. one of them being advocacy. It’s pretty easy to find yourself overwhelmed in the medical process. There’s not just physical stuff going on, but the emotional side gets kicked around pretty well too. That’s why, as a patient, having an advocate is so very important. NO ONE should EVER be in hospital or attending doctor appts by themselves -- there's just too much room for error in the process ... especially when the patient is struggling physically or mentally, or is in pain. I’d say it’s next to impossible for the patient to advocate for themselves and a second 'ear' is always good when interpreting what the Doctors or other medical professionals might share with you. We often take my sister-in-law along with us to Ken’s neuro appointments. Many times she has been the ‘voice of reason’ for us, both during the appointment by offering pointed questions and later, as we attempted to piece together all the new information that had been offered. We live in amazing times and most likely the first thing most of us do when handed a medical diagnosis is to RUN to Google, so it may seem trite to remind you of some basics. But utilizing the ‘basics’ will eventually give you a strong foundation for understanding and analyzing everything that may come your way on this journey. Ask for reading suggestions -- and don’t worry if it all seems like gibberish, it will eventually begin to make sense. It’s a lot like learning a new language. The patient in your life gets a lot of attention …. as well they should. But if you find yourself in the position of caretaking or advocating, you can’t forget yourself. There have been plenty of articles documenting stories of caretakers who actually pass before their patient. It’s very easy to focus, focus, focus on taking care of everyone else but you. Guess how I know this? I’m still learning to give myself permission to address my physical and emotional needs. My sister has been such a good example to me in this. Her husband has Frontal Temporal Disease and most of their life together, as they knew it, has disintegrated. She has found ways to nurture her heart and her body that allow her to gather her strength. She gets therapeutic massages for stress, she walks to and from work through all four seasons, she bought a kayak and spends quiet, restful moments on the lake, she surrounds herself with people who are encouragers in word and deed, and when she’s having a really hard day she makes Apple Dumplings. She’s practically world-renowned for those things! She takes care of herself, because no one else can. I’m learning from her. I also try to remind myself not to hold my breath figuratively. I’m trying not to put ‘life’ on hold as we walk out this process. It’s a really easy thing to do -- put your life on hold. Then you look back and realize you haven’t enjoyed the little, everyday moments that make up a life. I want to fully appreciate those moments -- reading out-loud from my mother-in-law’s journal as we complete yet another holiday round-trip drive, having the patience and time to let my grandkids ‘help’ prepare meals and together, work on a puzzle …. for the 10th time that day , and getting lost in the eyes of our 3-week-old newest grandgirl, knowing therein lies an ocean of love. Facing down illness is a tough road, full of twists and turns with always challenging and ever changing terrain. The goal is to travel as gracefully as possible. Together, we can help each other do that. 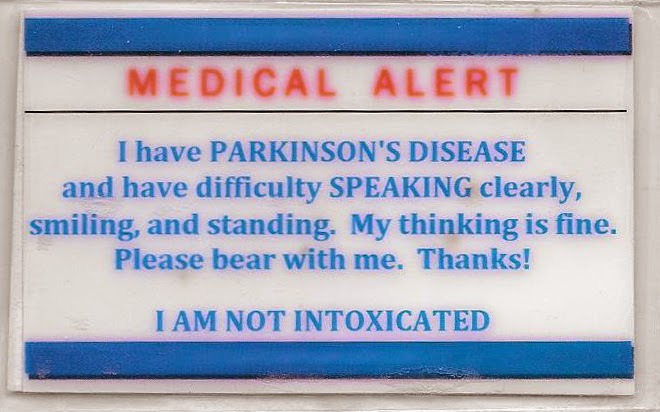 Whenever I write and post something that is critical and negative about Parkinson's Disease, I run the risk of sounding like I'm whining. To the contrary, I don't believe there is anything more significant to a person with this insidious condition than empathy - identifying with someone who is experiencing the same feelings and frustrations. That's why I write...for you who have PD. For those of you who don't have PD, but are still interested, this is a look "inside the Parkinson's Brain" - figuratively speaking, of course. Up until two days ago, I had mixed feelings about the speech therapy process. In my analytical world, I don't like to be told to do something without knowing WHY I'm doing it. Initially, I was told to say "aaah" as loud and as long as I could in a mid-range tone. They were testing my capacity for breathing with my diaphragm. It also became a benchmark to assess progress or decline over the course of time. There are some other exercises we do, also, but frankly, I tolerated these in hopes that we would go deeper into understanding the problem and maybe finding acceptable solutions. A light went on when my therapist answered a question I had asked about why I couldn't read aloud a long sentence...one that any 5th grader could tackle with ease. In so many words, she said my problem was physical not necessarily mental. What I am attempting to do (what I used to do without effort) is to synchronize my tongue, jaw, lips and vocal chords with my lungs and diaphragm until my air supply is used up, take another breath and repeat the process. "No problem," you say. Except in the case where none of the above muscles are working properly. I run out of air after four or five syllables. This is where I need to focus my attention and practice. Now I understand WHY I need to practice and WHAT it is I need to practice...synchronizing those muscle groups. Terrance -(breath)- cultivated -(breath)- tomatoes and turnips -(breath)- in his terrace -(breath)- gardens. Try that for yourself - aloud, breathing in deeply at each break. Now, try it without reading words from a page, but rather think a thought, visualize the words - with breath spaces - then say them. If the person you're addressing, can't hear you, say it again - louder...one sentence at a time. How did you do? For a guy like me that is used to doing everything at warp speed, it can become very interesting. My perception at this moment in time - is that asking me to try harder, is not unlike asking a person with Cerebral Palsy to try harder to sit up straight. Hopefully, with time and practice, my talking will improve. Practice, practice, practice. If you are considering speech therapy: Don't discount it early on. Hang in there - find out WHY you need to practice then the WHAT will make sense. This week, our Parkinson's Support Group held a potluck. Our friends, Tom & Jackie graciously picked me up at our house and drove to Bear Creek community - about 15 minutes north of Murrieta. Beckie couldn't attend because of work. Bear Creek is a gated community surrounding a golf course with a very nice community center building. Lorna was hosting the potluck. Jackie's enchiladas were a big hit, as well as my smoked salmon...both of which disappeared quickly. It worked out that I didn't sit with Tom &J ackie, but sat with two couples who lived there at Bear Creek: Roland & his wife and another couple originally from New York City. Breaking a cardinal rule, I didn't focus enough to remember their names, even though we were all wearing name tags. I will be more diligent next time. Without Beckie there to carry the conversation, I felt helpless, because as the discourse continued, it inevitably got to the point where I couldn't verbalize my thoughts. And, it was noisy in the room so the louder I tried to speak, the more stressful it became - which in turn caused more anxiety...making it extremely difficult to verbalize my thoughts. It was a vicious cycle and I found myself shutting down once again into a frustrating, unpleasant and depressing silence. AWKWARD!!! Beckie is such a help to me in those situations when she speaks for both of us. It gives me time and space to slow down, collect my thoughts and relax. I get into trouble when trying to say long sentences as opposed to simple phrases. Mentally multitasking has become a real challenge - they call it Executive Functioning - which I used to be able to do with flying colors. The more things (thoughts) on my plate, the merrier. But now - I'm limited to one thing at a time. I don't know which is worse, physical incapacity or not being able to express myself in conversation. I think the latter is worse. It becomes a constant battle to not withdraw and to avoid social situations... much to Beckie's chagrin. I think the toughest part is knowing that, before PD, I could carry any conversation, anytime, anywhere - with anyone. And now, half the time, my 5 year old grandson can't even understand me. THAT is hard. LOTS HAS HAPPENED SINCE MY LAST POST...mostly positive. and, after 3 and 1/2 years - the tremor that plagued my right hand is still gone! Bad News: walking and balance are becoming an issue, as well as being able to speak. Good News: I have a programming session scheduled at Stanford on Monday that should resolve those. Friends: We had a nice lunch with Tom & Jackie from our local Parkinson's Support Group. I really like them. Tom had DBS a few years back, and it's good to be with others to compare notes. Garden: Everything in pots - no dirt in the back "yard"... but they're growing well, tomatoes, cukes, basil, zucchini, rosemary, kale, brussel sprouts, and other edibles keep me busy. Granddaughter: Last I heard, her name is Olivia Lynne, aka Vida's little sister. Our Miracle Girl - Rachel didn't think she could have any more kids after her massive cancer treatments, but Ta Dah! We're excited!!! REALLY GOOD NEWS: I'm heading to Alaska again! Fishing, Family & Friends. Can't beat it - salmon fishing at it's best. Jefferson Jones asked some specific questions about the DBS process and I asked Beckie to respond at length. We try to remind people all the time that NO surgery is without risk. I'm pretty sure that the % of surgical complications in DBS is practically nil - compared to say that of open-heart, etc. Not to say it doesn't happen. I always say that when you can't live with the complications of your disease, then you willingly jump onto the DBS bandwagon! In retrospect, we now realize that there were questions we didn't even know to ask prior to surgery! And in our experience, you don't always get told all the details .... I think because those in the medical profession are SO familiar with the details, that they accept all that comes with it as normal process - forgetting that all this is NEW to we patients (and family & friends). That said, no question is too simple --- that's their job ... to provide the answers. Your neuro team should be able to tell you what to expect as a normal process of healing. Severe headache, nausea, fever ..... these are NOT good and should you experience these symptoms, contact your DBS hospital/ER/team immediately. you can subscribe directly from that page. This group has a huge database of information -- the only caveat I generally issue is to use the grocery store method when it comes to postings --- take what you need & leave the rest, remembering that there are people posting from all over --- some who've had great experiences -- some not. I would add that for the most part, those who've NOT had good DBS experiences typically had surgery done at a hospital that was convenient to where they lived and advertised that they 'do' DBS, but in reality didn't have the history/experience really necessary. This is SOOOOO important to understand and something I ALWAYS emphasize when encouraging people toward DBS: the DBS surgeon/team experience/ability is as important as the programmer's experience/ability ---- if the surgeon doesn't place the probes exactly, then no matter how great your programmer is, you are most likely not going to have a great DBS experience and conversely, no matter how well the probes are placed, if your programmer doesn't truly understand what they are doing, you're not going to be happy with the outcome. Bottom line: the place you choose for your surgery is VERY important. The Yahoo group has an article in the database of FAQs --- it covers a lot of these types of things. Phew!!!! that was long-winded!! Hope you don't mind .... but there's nothing more important than getting all the info you can when making life decisions.